AMI, Bristol, 8th November 2013 – Polymer demand growth in Europe for 2013 is expected to be static compared with 2012, according to Applied Market Information Ltd., which has just published its 2013 European Plastics Industry Report. 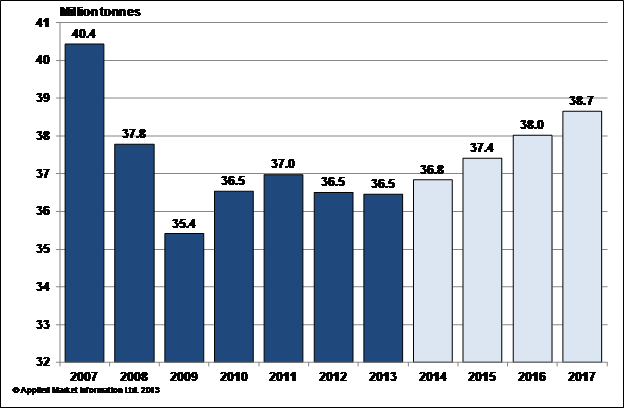 AMI calculates that the market for thermoplastics in Europe is currently 36.5 million tonnes, a volume that is still nearly 4 million tonnes less than the peak it hit in 2007. Although during 2010 and into 2011 the industry made a modest recovery from the devastating effects of the global downturn of 2008 and 2009, by the last quarter of 2011 the recovery was beginning to run out of steam in the face of the looming eurozone crisis. Although the drop in demand over 2012 and 2013 has been far less severe than in 2008-2009 – polymer producers and processors alike have been more savvy about managing their inventories and have not got caught out as they did in 2008 – the decline in government spending, manufacturing and consumer confidence still resulted in an overall contraction of polymer demand of just over 1% in 2012. However, whilst the market has undoubtedly been tough over the past five years, most companies have come through the downturn and continue to thrive and grow through the use of innovative technologies, material developments and new application gains. The discipline of the downturn has made companies cut costs, preserve cash and be judicious in their investments. Those that are suriving are increasingly thriving. Furthermore AMI views the industry now at the bottom of the cycle with demand expected to pick up again from 2014. Germany, the engine of the European chemicals and plastic industry, has been the strongest of the West European markets. 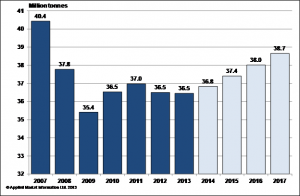 Although polymer consumption was down marginally in 2012 current market demand of around 8.2 million tonnes is only fractionally off the demand levels of 2007. The market has been sustained by the strength of its small and medium sized processors which have often developed leading roles in niche markets. Central Europe also continues to show positive growth, even if some of the smaller countries remain vulnerable to external shocks. Poland is the only country in Europe which has not technically gone into recession since 2007. Although polymer demand growth has weakened, it is still managing to show some positive trends for appliance manufacturing and consumer packaging, even though automotive production in 2012 contracted substantially. However, automotive production has helped to sustain demand in other Central and East European countries, particularly Slovakia and to a lesser extent, Hungary. On an application level packaging demand for polymers remained steady through 2012, accounting as it does for nearly half of all polymer processed in Europe but trends in downgauging, lightweighting and increased use of recyclate impacted on the overall demand for virgin resins. However, opportunities still exist in material substitution and new product development, e.g. PET bottles for the packaging of alcoholic beverages replacing glass bottles; barrier sheet and multilayer rigid and flexible constructions replacing glass and tin cans; plastic one piece closures replacing two-piece closures and metal tops. While markets are expected to return to growth next year, AMI acknowledges that the effects will be patchy and there will continue to be winners and losers across the European plastics industry. The countries of Southern Europe will continue to seeing shrinking demand as their economies structurally readjust, while Germany and northern European markets (Benelux, UK, Nordic markets) are considered to be more economically sound, which should help to drive growth at least in line with GDP. Central European countries are also still expected to show good growth, driven by ongoing investments in car production and electrical goods manufacturing although the success of their plastics industry will be dependent on growth continuing in the West. However, volume growth will continue to be offset by trends in lightweighting and downgauging meaning that polymer demand growth is unlikely to advance beyond GDP growth rates. As a result it is likely to be 2020 or beyond before the industry see demand back at its 2007 level again.